This contract is for use by an event planner with his or her clients. The event could be personal or corporate, from a wedding or ‘milestone’ birthday party to an office Christmas party, press conference or product launch. It provides for a wide range of possible involvement in the event whether single tasks such as organisation of the entertainment or catering, or complete management. This is a template contract for an event planner to use with clients. As is, it assumes that the event is a wedding, but it can easily be edited to be suitable for any other type. A specification of your work can be provided as an appendix or schedule separate to these contract terms, which means that whether you will be responsible for all or just some elements, the main body of the agreement should not need extensive re-editing for subsequent clients. This contract covers what you will do in round terms, such as when and how you will be paid, and what you expect from your clients. But this is not just a legal document. It also includes provisions for setting up all practical aspects of the deal. The contract can be negotiated or fixed. 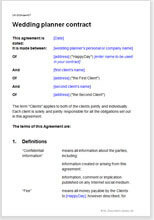 That is, you can present it and ask your clients to sign as it is, or you can allow a negotiation of terms. The procedure for appointing suppliers is covered precisely so that you cannot be liable either to pay a third party or to accept liability if any should fail. It also deals fully and precisely with the Consumer Contracts (Information, Cancellation and Additional Charges ) Regulations 2013. This law gives you very extensive obligations to inform your consumer clients, as well as imposing cancellation provisions. We explain all this very clearly to you in our extensive drafting notes. The agreement is drawn using the informal “you” and “we”, but can easily be edited to use the third person if you require it to appear more formal. It is still just as binding in law either way. The law in this contract is largely common law that deals with the basics of contracts: offer, acceptance, price and payment, duties, returns, dispute resolution, liabilities and risk. Provided you comply with the law, you can set the terms you like. We include extensive helpful and informative drafting notes to allow you to edit the document to your exact requirements. "We are a small UK business who can not afford our costs to get out of control. NetLawman is a great option for young small businesses." CCF(Automotive) Training & Consultancy Ltd.